The Merrimack County Stamp Collectors will hold its monthly meeting at the Bow Mills United Methodist Church, 505 South St., Bow, on August 21, beginning at 1 pm. We invite all who are interested in stamp collecting to attend, share their interest, buy, sell and trade. Meet other collectors and learn more about their hobby and enjoy the fellowship of others with varied interests in Philatelic resources and issues. Gain new insight and knowledge, sharing news articles and stories abut stamp collecting. For more information call Dan Day at 603-228-1154. The South Pittsfield Friends Church will be open on Sunday, August 12th with Rev. Henry Frost as the speaker. Service begin at 1:00 pm and all are welcome. The church will also hold services on Sunday, August 26th with Pastor Harold Muzzey as the speaker. PITTSFIELD AND EPSOM GET A NEW OPPORTUNITY! For the first time there will be a Pittsfield Republican challenging incumbent Mike Brewster for State Rep. to the General Court. During his tenure as chair of the Pittsfield Select Board, NH native Col. James C. Allard, Ret., has been invaluable as we pursue positive changes for the town’s benefit. He volunteers a huge amount of time to union negotiations that are fair to employees and more in line with what can be realistically expected of our small town; the CDC which is working diligently to promote every opportunity for economic advancement; and numerous other tasks as they arise to those who serve the town. Jim can see where real needs exist and focuses on those needs without the distraction of any personal agenda. After a lifelong career in the service, he’s doing everything possible to make his home state the best it can be and spend a little time simply enjoying his so-called “retirement” with wife Gail in a historic home on Tilton Hill. Fortunately, Jim has a lot more time that he wants to use at the State House as a strong advocate for the specific needs of Epsom and Pittsfield. For those who don’t know Jim, you’ll find him friendly, intelligent, down to earth, firm and focused in his convictions and respectful to all. He has the ability to cut through minutia and periphery distractions that accompany almost all topics that come before us in small town politics. If you agree that our residents of Pittsfield and Epsom could use a voice in the State House that knows how to get things done and bring some real benefits that are available at the state level, you’d do well to vote for James Allard for Representative. Who could possibly think that Pittsfield couldn’t prove a case of hardship in a court of law?? Pittsfield is one of the poorest towns in NH, has one of the highest property tax rates, has one of the highest rental unit to single family unit ratios per town population in NH, takes longer to sell property than other NH town, AND, has a proven depressed real estate market value compared to other towns. There’s a lower than average number of students proceeding to college, and an above-average number looking for basic employment. 40 adult-males would directly compete with this job-pool. This is fact, not fiction. I have nothing against Teen Challenge, but a 40-bed, adult-male facility inherently requires a certain logistical infrastructure and a wealthy enough tax base to absorb any costs and real estate depression values that its presence would create. The town of Pittsfield simply does not have the infrastructure and already has depressed real estate values. “The values of the surrounding properties are not diminished”(a condition of a variance). The Zoning Board must consider these facts. I wish Teen Challenge luck but I live the thought “right house, wrong town” every day of my life. I love my farm, and I love so many aspects of Pittsfield. Right now, Pittsfield is at the end of its financial rope and needs solutions not additional strain on the system. There is at least one more public hearing by the Zoning Board of Adjustment to hear input from anyone who has something to say on the matter of Teen Challenge moving from Manchester to the convent on Fairview Rd., which is for sale. This is a drug, alcohol and “other life challenge” rehabilitation facility for males only, ages 18 to 25, currently operating with approximately 26 beds in Manchester, that wants to expand to 40 beds and relocate to Pittsfield. Those being rehabilitated can come from all over the northeast, New York, New Jersey, and from as far away as California. This facility has no medical staff in attendance and is manned in large part by prior “graduates” of the two-year program. This is not a correctional institute and anyone is free to leave at any time. As a faith-based facility, licensing and government oversight is not required. Teen Challenge has requested a Variance from the Zoning Ordinance that would allow a use that is implicitly not allowed in the Suburban zone. After hearings from the public have been completed, the Zoning Board of Adjustment must deliberate and decide whether to grant or deny the request to allow this 40-bed drug and alcohol, etc., rehab facility to relocate in Pittsfield. Anyone who has property value concerns, information, questions or statements they would like the Zoning Board to consider, can be heard this Thursday evening, August 9, at 7 PM downstairs in the PMHS lecture room. In response to the letter criticizing our majority elected representative, Carol McGuire, we would like to respond that we are pleased with her service to our town. In her many years of service, Carol has been engaging and helpful, informative and transparent, timely, available and neighborly. “Engaging and helpful” in that she drafted legislation of concern to us and facilitated the opportunity for us to testify on its behalf at the legislative committee hearing. “Informative and transparent” is exemplified by her weekly letters and explanations of why she voted the way she did. We do not regularly see any other representatives and senators located in the Suncook Valley Sun distribution areas doing that except at election time. ”Timely, available and neighborly” describes her character. She answers questions and calls. She will share a recipe like your next door neighbor. She is approachable and not aloof. I am glad that she and Dan moved to the area because New Hampshire is a Free State: “Live free or die, death is not the worst of evils.” Gen. John Stark. When it comes to her stating her personal preference to expand school choice, we believe that she is representing ALL her constituents and not only the public education sector. Seems to us that “pro-choice” is only abhorent when it does not suit your personal preference. Join us in re-electing Carol McGuire in November for the NH House. Sheep can be haltered and led but the sheep we tried to load were not haltered. Benson, the border collie, was hot in pursuit of a ewe, his canine hormones taking over. 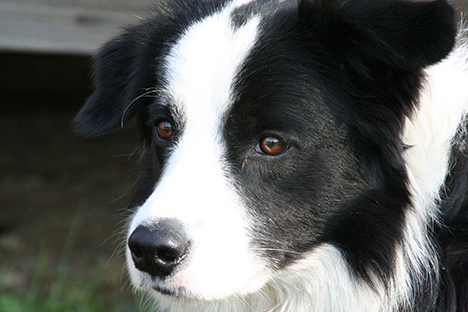 Border collies are bred, born and trained to herd sheep, following the commands of their owner. Unfortunately, on that day Benson decided to herd the sheep his own way; AWAY from the waiting stock trailer instead of into it. Nancy, the sheep owner, and I watched as Benson unhelpfully chased the sheep away toward the road, doing exactly the opposite of what was needed. Earlier that morning, at 4 o'clock, I had put together a snack for the road, heated up a cup of decaf, and drove the heavy-duty pickup truck and 16-foot stock trailer to Nancy's house in Sanbornton, about 20 miles north of my farm, to pick up three sheep. The sheep were culls from Nancy's herd. She has a calm, friendly flock of sheep and these three delinquents did not fit in. 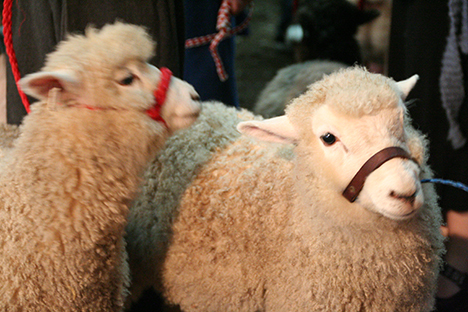 I was picking them up on my way to North Haverhill, N.H., where they were to be processed into ground lamb. The processor wanted them at the plant at 7 a.m., hence the super-early departure. We raise cattle and pigs, but not sheep. For one thing, sheep need excellent fencing, which we don't have. A pack of coyotes lives in the forest that abuts the farm, and sheep is their favorite dish. The cattle are equipped with horns and hooves to protect their young from attack, but sheep can only run to escape; a weak defense against a pack of hungry coyotes. Rather than raise sheep as food-for-coyotes, instead we buy sheep from other local farmers who have better fencing, and on this day I arrived at Nancy's at 5 a.m. to load the three delinquent sheep. I backed the trailer up to the sheep's stall, and we set up metal stock panels between the stall and the trailer to form a chute. That's when Nancy left to get her dog Benson, who usually is an excellent herder. When Benson was too afraid to go into the stall with the sheep, I should have known he would be no help today. We pushed Benson out of the pen and forgot about him. Using grain, Nancy lured the sheep into the trailer. Watching from the sidelines, Benson decided it was time to address his irrational fear of sheep. He leaped into the trailer, and before we could close the trailer door or count to three, he had chased out all three sheep. Then the dog, with his canine instincts activated with me yelling uselessly at him to desist, chased the sheep around the yard. Once we got him under control and locked inside the house, we tried again to load the sheep. What is the best way, sans defective herding dog, to capture sheep? With another sheep, of course! Again using grain, Nancy enlisted the help of one of her socially reliable sheep, which led the delinquents back into their stall, then into the trailer. The tame ewe rejoined her flock, and the three delinquents traveled away with me. Even with the canine drama, we made it the processor by 7:30 – late, but not too late. Livestock handling can be tricky, but I generally know what my cattle and hogs are thinking. Sheep don't seem all that complicated either. But I must admit, there's one border collie who's got me scratching my head. Carole Soule is co-owner of Miles Smith Farm, in Loudon, NH. She can be reached at cas@milessmithfarm.com. 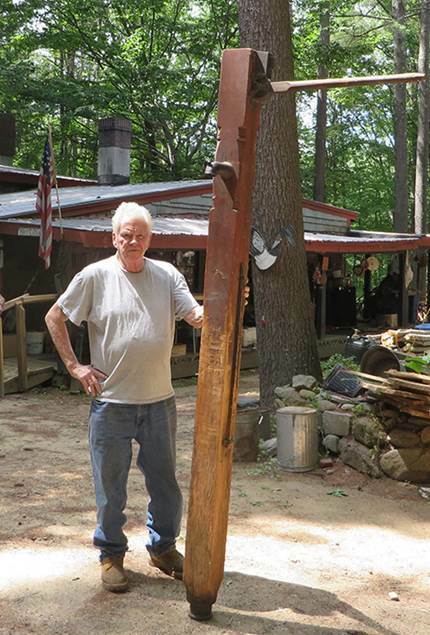 Thanks to the generosity of Larry Collette the Historical Society has received a wonderful artifact of the town’s history—a very early town pump. Where it was located has not been learned but it was definitely used in Pittsfield. It had been stored in the basement of the building at 34 Main Street for decades until Mr. Collette acquired it. A hearty thank you is extended to Mr. Collette for his thoughtful donation. Old Home Day was a hoot. Congratulations to Rob and GEF Freese for being chosen Citizens of the Year. They certainly earned this honor. The funniest thing happened after the parade on the corner of Elm and Main. A young boy came up to me and my wagon and pointed to my no mo meth sign. He said, "you spelled 'math' wrong." I said, "what did you say?" He repeated a little louder, "you spelled 'math' wrong." Yup, he was right. The most serious thing was when I had a conversation with my representatives, Carol McGuire and John Reagan. I talked to them about how pot was my priority issue. The part that really bugs me is busting young people and searching young people. I think that may be getting a little better now that we are surrounded by legal weed. Now, however, my priority issue is school funding. I want the State to get their stuff together and tax all property owners the same property tax rate for the operation of its schools. How hard can it be to evaluate all the property and pay the school districts like $15,000 to $20,000 per student and have an equal education? 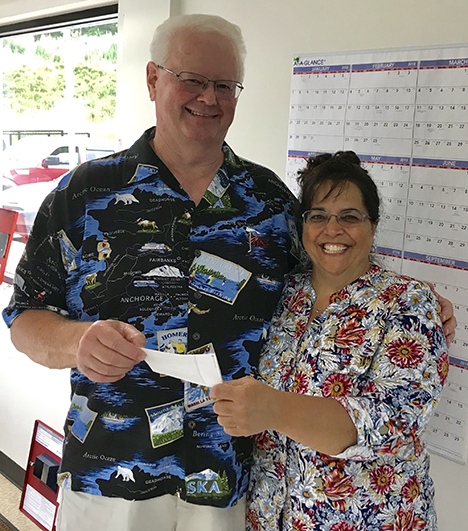 Stan Bailey, Suncook Valley Rotarian, presents Lisa Stevens, BCEP Administrator, with a check for $1,000 donation to create a welcoming garden at the facility entrance. Thanks to the generous donation of $1,000 from the Suncook Valley Rotary, donated compost and mulch from Dirt Doctors in Pembroke, NH, and the collaborative partnership with the Pittsfield Beautification Committee, a welcoming garden will begin to come to life at the entrance to the facility. This will be a living display of civic pride to all who enter the gates. It is with great appreciation and hope that the community’s continued support of the Suncook Valley Rotary and the Pittsfield Beautification Committee fosters an ongoing relationship with BCEP that will grow and flourish for many years to come. Designer, Nick Penney from the Beautification Committee and Creative Gardening, is spearheading the project and welcomes all who wish to join in on the creation. Contact Nick at 988-3152. The look and feel of the downtown can influence the decisions of potential residents, visitors, and businesses. A vibrant downtown serves as a gathering place, a place for people to dine, shop, and conduct business. First Impressions is an assessment program that examines downtown through the eyes of potential residents, visitors, and businesses, helping communities learn about their opportunities and empowering them to take steps to improve their downtown. Pittsfield's Community Development Committee (CDC) has partnered with the UNH Extension to take part in the NH First Impressions program. Pittsfield was matched with Tilton, who has a similar downtown based on a number of criteria, such as size, location, amenities and natural features. Both communities agreed to build a team of community volunteers to complete visits to the other community and report on their findings. The communities have been assessed in the following areas: Business, Park, Points of Interest, Public facilities, Sidewalks, Crosswalks and Trails, Streets and transportation, Waste and recycling, Community Art, Displays and Signage, Downtown Entrances, Landscaping, Lighting, and Seating Participants have documented their visit, and are scheduled to report out and engage with the community to take steps to improve downtown Pittsfield. The University of New Hampshire Cooperative Extension provides facilitation, training, a written report, and follow up support for a year. A community forum has been scheduled to share the report findings on October 17, 2018 from 6:00 to 8:00 PM. The anticipated venue for the forum is the Pittsfield Middle High School Media Center. Follow up to the forum will include the formation of community-driven action teams. Along with the finding of the visiting team, the Pittsfield Community Development Committee is encouraging residents to include their own ideas of how to improve upon our downtown by suggesting your own ideas. Residents may choose to use the form located in this week's Sun, or email suggestions directly to the CDC using cdc@pittsfieldnh.gov. Completed forms may be dropped off at the town hall to be directed to the CDC. Downtowns are the heart of New Hampshire's communities. First Impressions is an innovative assessment program that examines a downtown through the eyes of potential residents, visitors and businesses, helping communities to learn about their downtown’s assets and opportunities for improvement. Most important, the program provides local residents and business owners the skills to make their community a vibrant place to live, work, and visit.